The thousand years explored in this book witnessed developments in the history of Ireland that resonate to this day. Interspersing narrative with detailed analysis of key themes, the first volume in The Cambridge History of Ireland presents the latest thinking on key aspects of the medieval Irish experience. The contributors are leading experts in their fields, and present their original interpretations in a fresh and accessible manner. New perspectives are offered on the politics, artistic culture, religious beliefs and practices, social organisation and economic activity that prevailed on the island in these centuries. At each turn the question is asked: to what extent were these developments unique to Ireland? The openness of Ireland to outside influences, and its capacity to influence the world beyond its shores, are recurring themes. Underpinning the book is a comparative, outward-looking approach that sees Ireland as an integral but exceptional component of medieval Christian Europe. Introduction Brendan Smith; Part I. Christianity, Invasion and Conquest: 600–1200: 1. Communities and their landscapes Edel Bhreatnach; 2. Learning, imagination and belief John Carey; 3. Art and society Jane Hawkes; 4. The Scandinavian intervention Alex Woolf; 5. Perception and reality: Ireland c.980–1229 Máire Ní Mhaonaigh; 6. Conquest and conquerors Colin Veach; Part II. English Lordship in Ireland: 1200–1550: 7. Angevin Ireland Nicholas Vincent; 8. The height of English power: 1250–1320 Beth Hartland; 9. Disaster and opportunity: 1320–1450 Brendan Smith; 10. The political recovery of Gaelic Ireland Katharine Simms; 11. Continuity and change: 1470–1550 Christopher Maginn; 12. Late medieval Ireland in a wider world Michael Bennett; Part III. Religion, Economy and Culture, 1000–1550: 13. The Church, 1050–1460 Colmán Ó Clabaigh; 14. The economy Margaret Murphy; 15. Gaelic culture and society Katharine Simms; 16. The structure of politics in theory and practice, 1210–1541 Peter Crooks; 17. Material culture Rachel Moss; 18. The onset of religious reform: 1460–1550 Mary Ann Lyons; 19. Contexts, divisions and unities: perspectives from the Later Middle Ages Robin Frame. Brendan Smith is a graduate of Trinity College, Dublin and was Rooney Family Newman Scholar at University College Dublin before joining the University of Bristol in 1993. He was appointed Professor of Medieval History at Bristol in 2014. 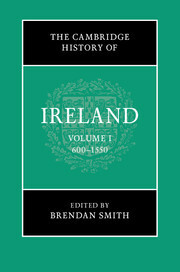 He is the author and editor of numerous books on medieval Ireland, including several collections of historical documents. His research focuses on the English colonists established in Ireland in the decades around 1200, and the relationship of their descendants with England and with their Irish neighbours. He is a Fellow of the Royal Historical Society and of the Society of Antiquaries of London.